Heart attack on smokers is three times greater than nonsmoker. Is this true? Yes, it seems to be true according to the government health office who conducted this survey. Once you stop smoking, in two years, the risk of getting heart attack or myocardial infarction will reduce dramatically. If you smoke 10 sticks a day, the risk of getting heart attack is about three times higher. If you smoke about a pack a day, the risk of getting heart problems will be about 3–4 times more than nonsmoker. And of course, if you are smoking more than a pack a day, then the risk of getting heart attack will be four times greater than nonsmoker. We know that blood clot easily occurs when smoking. This is also evident by animal experiment. Arteriosclerosis is for sure due to smoking. 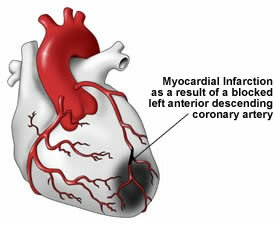 Obviously, myocardial infarction is caused by arteriosclerosis. We know that cigarette smoking is health hazard, so let us stop smoking. Of course, I am not a smoker. 2. "Hidden Diabetes May Result To Sudden Heart Attack"
3. "Three Bags of Green Tea a Day Can Cheat Heart Attack"